We finally found it! Little Mexico. 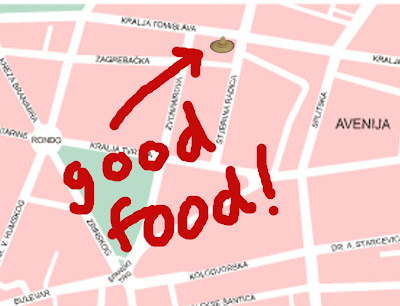 I blogged before about my reticence to deal in certainties when discussing life in Bosnia and Herzegovina but it could be Mostar’s only Mexican restaurant. We’ve lived here a year and we only heard about it last week. However, I now half suspect I’ll find and Indian around the corner or a Chinese take away just outside old town. Perhaps annoyingly, the restaurant was tucked away on the far corner of a building we’ve walked past a hundred times. However, we’ll not let that taint our enjoyment of this most welcome discovery. Its menu - the physical booklet that is – are the most impressive we’ve seen out here, boasting appetising photos and a Mexican history lesson, and a breakdown of what actually goes into guacamole! Without attempting a serious gastronomic review I’m going to say it’s well worth a visit. And in case you are in the area and want to check it out I’ve done you the favour of including a map. That way you may avoid walking quite as far as we did in our search for a little salsa! Welcome back to Bosnia, hope you had a fantastic time back in the UK. It is good to be back. We had fun in the UK but it was weird to feel a bit like a visitor. Hope you all enjoyed your time in sunny Mostar!